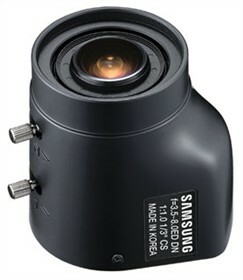 The Samsung SLA-3580DN CS-mount Varifocal Lens has a focal length of 3.5-8mm, and an aperture of F1.0. The Auto Iris feature is highly flexible in producing consistent video signals as it can help the camera to adjust to drastically changing light levels. Focus and zoom are manually controlled. Using a convenient setting control, users can adjust the zoom amount to exactly what they want in the lens' range of field. The Samsung SLA-3580DN has many exciting features for users of all types. You can extend the lifetime of your Samsung SLA-3580DN with the purchase of a FactoryOutletStore Factory Protection Plan. See the Samsung SLA-3580DN gallery images above for more product views. The Samsung SLA-3580DN is sold as a Brand New Unopened Item.